Gondar is the old capital of the Amhara region and the closest large town to Burubwax, considered by some to be the traditional home of the Asmari. The Gondar beat is distinct in style from Gojjam, or Wollo, which also sit within the same region. 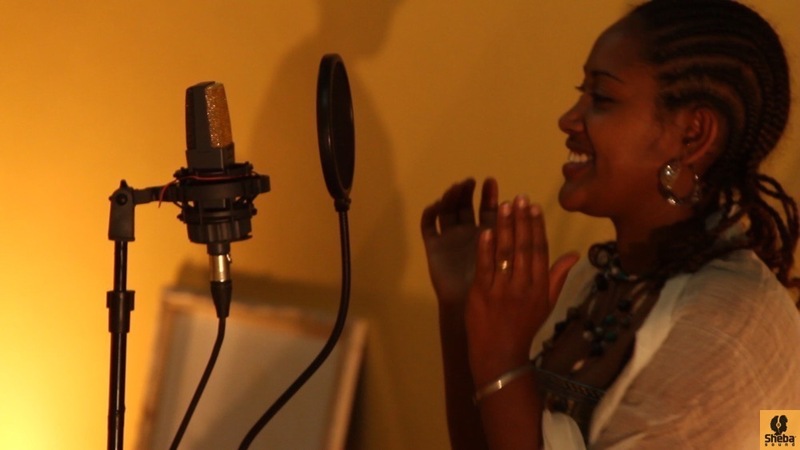 The singers we recorded were all professionals working at various local Asmari music houses (Asmari Bet) in Gondar. The two tracks presented here are sung by Fantaye Asmare. She blew us away with her strong voice and professional approach. We were also chuffed to stumble across the only female professional kebero (drum) player we’ve so far come across on our travels (also called Fantaye). 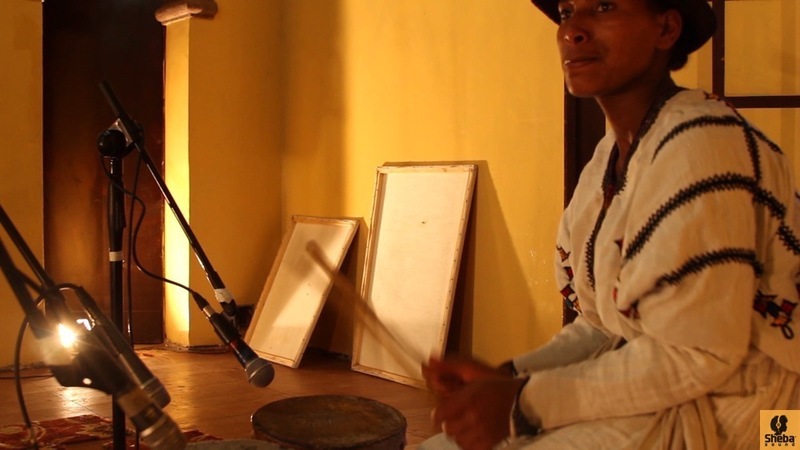 She holds down the beat in her family Asmari Bet every night, effortlessly gliding between Gondar, Wollo and Gojjam rhythms, like she was spreading butter on toast. We were extremely lucky to be allowed to record in the old castle of Ras Giim, a stunning historical backdrop. 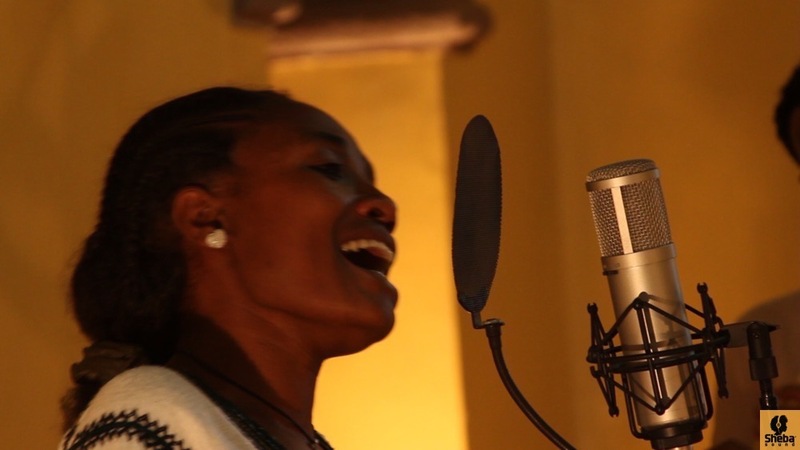 As well as these two recordings, we include an interview with kebero player Fantaye Asmamaw. Tezeta – probably the most regularly played song in any Asmari Bet. Most famous singers at one time or another have had a stab at releasing their version of Tezeta. A favourite of Sheba Sound comes from the 70s, courtesy of Getachew Kassa, who slapped two different versions on a 7″ (Amha AE 530). The Tezeta forms one of the four musical modal systems present in music originating from the churches. Its lyrics refer to the nostalgia of past love. 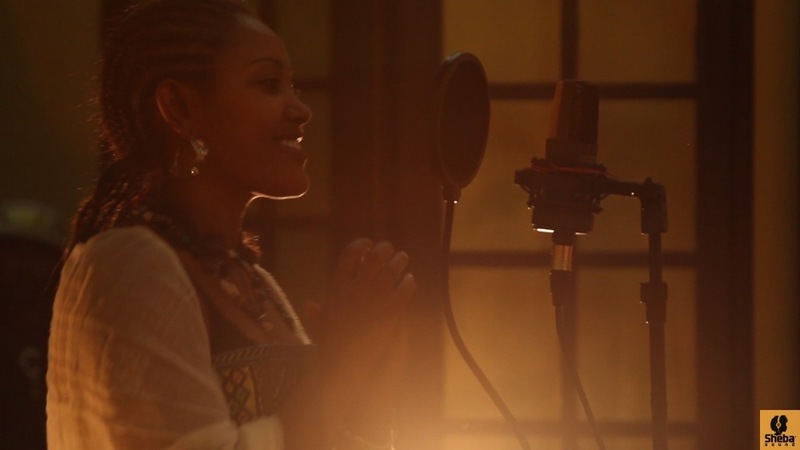 Yetemonamonew – A traditional Gondar song. The next day we interviewed Fantaye Asmamaw, the kebero player, at her place of work, the Balageru Asmari Bet in Gondar. What is your work? What do you do at Balageru? How long has it been since you started playing the Kebero? It is around eight years now. What is it that first attracted you to traditional music? How did you begin playing the kebero? First, I came to this place, I was a child when I came. Then the owner taught me the Kebero, and I continued with that. Can you tell me where your Kebero came from? where the wood comes from? What it is made of? The Kebero is made out of goatskin, the stick is wood. Is there a special way it is made? A special type of wood maybe? No, the wood is “zigita” and “weyra”. What do you personally think makes the Gondar music special, can you tell me about it in general? Gondar and Gojjam are unique, so are Tigray, Gurage, Oromo etc. In what way do they differ from each other? 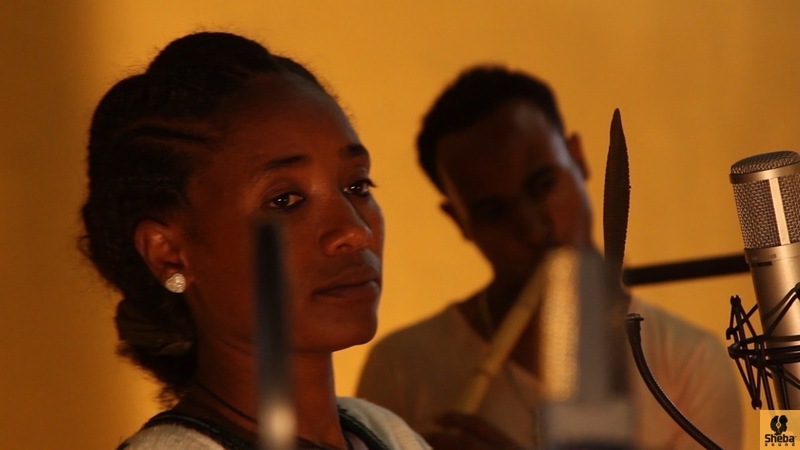 How is Gondar music different, for example, when you play the Kebero? It is different, I’ll show you on the Kebero, I can’t by my mouth. Ok, show us by the Kebero. Which one do you play regularly, which types of music? We mostly play Gondar, Gojjam, Guraginya, and the like. We play that. When you listen to these different types of music, where do you think they originated from in the beginning? They make the Masinqo by their hands, it is made of wood. And then there is the tail (of the horse). What are the traditional instruments made of? Masinqo is made from wood and from (horse) tail. Kebero is made from animal skin (leather) and metal. The washint is made from bamboo. Ok, are there special songs for special occasions, like weddings for example, in the Gondar culture? If you could tell me something about that. Well for weddings, there are particular wedding songs. Songs like Abaw Jaliye. Ok, how about for other occasions and holidays. Are there special songs that are played? On holidays we play (traditional) Gondar or Gojjam. At what times do people usually play music in the countryside? Even if they are not musicians, when do the people usually sing to entertain themselves? When they have weddings. They play the kebero and also sing with their voices. Is it musicians that play or is it just the people? It is just the people. Can you tell me what kind of life it is to be a musician, from your own experience? Let me now ask you a little bit about yourself and where you come from. Where were you born? I grew up in Gondar but I was born in the countryside. Can you tell me a little about the music that is played around there? I didn’t grow up there much so I only know a little. How old were you when you came to Gondar? I was seven or eight years old. What did you do before you started playing the kebero? I did not do anything. I came from the countryside and stayed inside the house for a while. Then I came straight here. I came here and she (the owner) raised me. I learned the kebero like this. She taught me. So this is where you started playing the kebero? Do they play Gondar music in the place where you were born? They don’t play it, they just play songs like “Mela New Mela”, they play countryside music with the kebero. When did you first want to play the kebero, how did you get interested? I worked as a waitress when I first came into this place. Then she (the owner) showed me how to play the kebero, and I continued in it. When did you come to know you are a good kebero player? I do not admire myself saying I am a good kebero player, sometimes people say that and admire me, but I don’t say that myself. I believe you have the love of playing the kebero in you though? As they are saying now as well, you don’t see women playing the kebero much. Yes, there are none, I am the only one in Gondar. What do you feel being the only female kebero player around? What kind of reaction do people give you? It is good, I am happy. When people see you, what kind of comments do they give you? They say I am good. How do you feel about that? What do you feel about or do for other girls that are interested in playing the kebero? I feel good about it, happy. Do you see other women getting more involved in playing the kebero in the future? Is it important for you to see this? No, there aren’t any; they don’t. Only guys ask me. What do you think of the future, where do you see yourself in this profession? I want to grow in this profession. Do you think the music is growing? Yes, it’s growing. There are good performers in the cultural houses (Asmari bet). How is the life being “Asmari” you grow up here right? Tell us about your daily life? Well they have their own house they don’t live here. We live here.